Eight years ago Deelara traveled by train from Burma to Bangladesh, then she took a bus from the border of Bengal to India’s northern-most state of Jammu and Kashmir. “We couldn’t stay there as they did cruel things to our young boys … We had no food,” Deelara, 15, said. 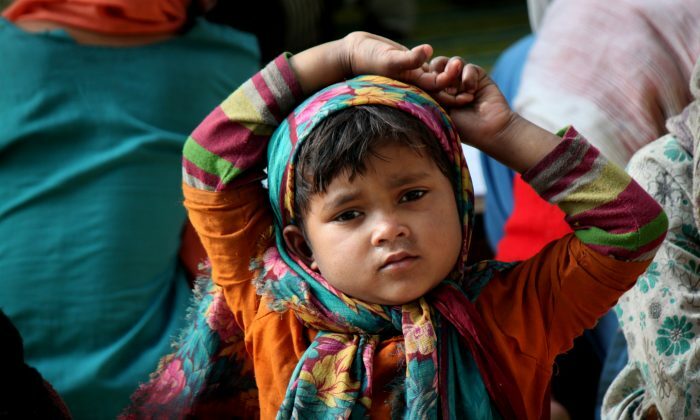 She is one of many of the Rohingya ethnic minority who had to flee Burma. Rohingyas are religiously and linguistically related to the Chittagong ethnic group in Bangladesh and are called Bengalis in Burma. But living in India is not easy for her either. “In Myanmar (Burma), the Rohingya are told ‘Bengali, go back to your country!’ and in Bangladesh, they are told: ‘Burmese, go back to your country!’” said Chris Lewa of the Asian Forum for Human Rights and Development. In a statement to the Working Group of Minorities of the U.N. Commission on Human Rights, Lewa describes Rohingyas lack of rights. “The government has identified ‘135 national races’ and the Rohingya do not feature among them. Their present legal status amounts, in international law, to de facto statelessness,’” Lewa said. Such a policy according to Lewa has encouraged intercommunal tensions and has led to two massive exoduses of 250,000 Rohingyas from Burma into Bangladesh in 1978 and in 1991–1992. Of those 250,000 only 20,000 are registered, and they are living in appalling conditions in refugee camps in Bangladesh and around 200,000 are surviving illegally in the country. Thousands of these refugees from Burma have been illegally transported to India, Malaysia, Pakistan, and Saudi Arabia. Organizations working with Rohingyas said it’s important to introduce constitutional reforms to end the exodus and persecution of Rohingyas. The nonprofit organization, Physicians for Human Rights (PHR) reports 140,000 Rohingyas have been displaced from Burma since June 2012 in various spikes of violence. “We want to go back but they will kill us. They burn our mosques and don’t even allow us to say namaz (Muslim prayer),” Deelara said. Escape from the country is also marred with perils. On Nov. 2, 2013, a boat carrying 70 Rohingyas from Burma to Bangladesh sank off the Burmese coast according to a PHR report. “Dozens remain missing, while the very few survivors were returned to the same camps they had risked their lives to flee,” the report states. Deelara lives with seven other families on a small piece of vacant land in the Narwal area of Jammu. Their homes are structures made of wooden planks, dirty old cloth, and tarpaulin sheets. There are two plastic chairs in a corner and a huge gunny bag of rags is lying in another corner. Just outside on the road a Rohingya Muslim woman, wearing a dirty shawl on her head, is washing clothes by a broken water pipe. According to Shuchita Mehta, a public information officer of United Nations High Commission for Refugees (UNHCR) at New Delhi, there are 4,000 Rohingya refugees and 2,000 Rohingya asylum seekers in India. “They are living in various locations across India, including Andhra Pradesh, Delhi, Jammu, Haryana, Rajasthan and Uttar Pradesh,” Mehta said. About 3,700 Rohingya refugees and asylum seekers in Jammu registered with UNHCR are probably living in much better conditions than others living in Bangladesh and Burma. According to Relief International, the Rohingyas living in official refugee camps in Bangladesh have no permission to work or leave the camp. Deelara was married in India three years ago, a right for which she could have faced many restrictions in Burma. However that also meant she was married when she was only 12. Her husband works 358 miles away in Delhi as a construction worker and visits her once in a month. “The Rohingya find themselves in a foreign urban environment with limited education, they often work as daily wage laborers, the low pay of which may not cover their basic needs,” Mehta said. Rohingya women and girls are especially vulnerable to exploitation and abuse. “We earn by rag picking. Some days we earn 50 or 100 ($1.60) rupees, sometimes it’s only 20,” said Naseema, Deelara’s neighbor. Outside the settlement on the footpath, an old Rohingya woman stretches her hand out asking for money, while the young Deelara stands and looks away. Living in India, Deelara is not aware of the changing political situation in Burma. She’s not even aware that Aung San Suu Kyi is no longer under house arrest and thinks that if allowed to “work” Suu Kyi will bring all Rohingyas back to Burma. But that would require building strong democratic institutions, which is a long-term process.